Seven wild European bison (bisonte in Spanish) have been released into a 20 hectare enclosure in Palencia as part of a long-term plan to possibly reintroduce the animal to the Iberian Peninsula after an absence of 900 years. Bisons were once common in the deciduous and pine forests of northern Spain as is shown by the wonderful cave paintings of Altamira, and they probably survived in Navarra until the 12th century when they were hunted to extinction. It is also speculated that bison undertook winter migrations from the north to the south of Spain, and that the ancient transhumance sheep paths followed these routes, though other studies suggest the bison was only ever present in the north (here). The five females and two males brought from Poland do not yet form part of a real reintroduction project, but rather a captive breeding programme under the auspices of the World Conservation Union partly with the idea of stimulating the local economy through tourism in a depressed region. 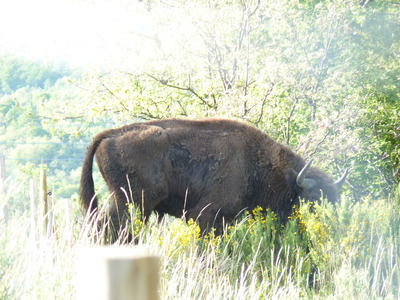 Bison watching, hunting, meat and their role in reducing the risk of forest fires by eating undergrowth have all been cited as possible beniefts. According to Fernando Morán, the vet in charge of the project, the WCU has chosen Spain because of the large areas of uninhabited land in comparison with other European countries. Some 3,000 European bison survive in semi-wild conditions in Poland and other Eastern European countries, where they are discouraged from migrating by artificial feeding. Numbers are kept down by selective culling. Wolves, which are present in Palencia, seem only occasionally take them. As head of the Spanish state, King Juan Carlos did his bit for European bison conservation when he legally shot a bison in Poland in 2004.